Urban Sardines played in a GAP store. Musical Chairs to the instore stereo. Bingo using the McDonalds menu and the cashiers as the bingo callers. The London bid for the Multinational Corporate Games was a resounding success, and with the thorough backing of Ken Livingston (London Mayor) it could do nothing but good for London, and its aims to become Europes premier shopping capital. The Space Hijackers (Corporate Sponsorship Partner of the games) printed up several thousand official game cards so that future bids to hold the games will be possible. Due to the omnipresence of the four multinationals within our high streets, these games can be taken to almost any city. There are already plans to hold the 2005 games in Manchester. If you would like to organise a bid for a games in your city please contact the Space Hijackers who can supply official gaming cards. Each athlete observed a strict training programme before entering the games, consisting of minutes of warm up and a diet of random food. There were around 60-70 entrants in the games this time, with athletes travelling from all over Europe to take part. Due to the size of the Stadiums (Shops), and strict security measures imposed by the Mayor and the Metropolitan Police (Police on every door), it was decided to split into three teams. These three teams would take part in each event simultaneously in three different locations, before meeting up together for the final in Nike Town. Click here to read the rules of the games, as printed on the official game cards. Urban Sardines a sweaty game for a sweatshop store. 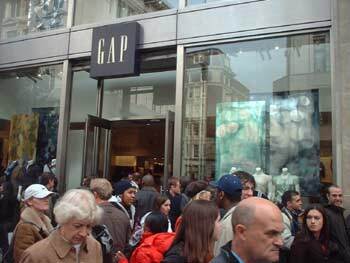 One contestant goes into a GAP store and finds a hiding place. After a count of 50 the other contestants head in to try and find them. Once you find the sardine you must join them in the hiding place. The last person to find them looses. Our team was informed to go to the Oxford Street GAP stadium, just by Oxford Circus. Agent Arthur had volunteered to be the sardine to start the games and he headed in just before us. After a count of 50 the other athletes entered the store searching for him. It took me a while and after searching the upstairs floor I headed back down to the ground level. Near the rear of the store I saw a bit of a commotion and headed over. Crammed down on the floor behind a jeans display were around 10 other entrants and Agent Arthur along with a number of security guards. I quickly squeezed into the mass of athletes just as I heard the store manager coming over to judge the competition. Luckily the security were keeping the public and fans at bay, although I found their rule on no photography a little harsh on the fans. As more and more contestants joined us the situation became more tense and the atmosphere much more heated. However luckily our training kicked in and we squeezed in tight. Eventually the last contestant arrived and the manager declared the game over. The helpful security pulled us out from the tangle we had got into and escorted us past the fans and out of the stadium. 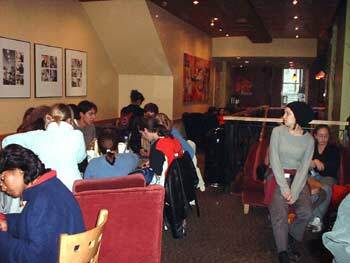 Everyone heads into a Starbucks and occupies a chair. 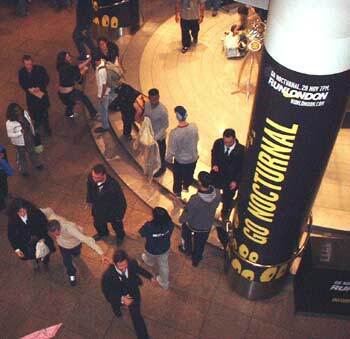 Once a pre-chosen contestant enters the store the game starts. Every record change on the instore stereo you must swap chairs. Different chairs are worth different points (see the chart on the official game card) fill in your chart as you swap seats. The first person to get 100 point wins. They must stand up and shout "Ive been Starbucked" at which point everyone has 10 seconds to evacuates the store. Heading past the every present security our teams made their way into the Stadium and began to look for seats. As soon as the chosen contestant entered the game began. Several of the public were very pleased to have random athletes ask to join them at their tables for a minute before moving onto another table, unfortunately there was no time to sign autographs though. Once the game was into full swing the first few athletes were discovered by the Starbucks referees and disqualified from the game (once you are found you are out). They were carefully escorted past the public to the safety of outside of the stadium. I had racked up a score of around 55 points and things were looking hopeful, when suddenly Agent Arthur sat down on a table with me declaring that he only had 5 points to go. It seemed I had wasted too much time with my single chair in the toilet cubicles! No sooner had I began to change chairs again when Arthur stood up and declared himself the winner, shouting loudly to the stadium. The security were immediately at the scene to congratulate him and console the rest of us. Although they did seem to take the "evacuate the store in ten seconds" part of the rules a little too zealously. For this event you will need the Bingo card printed on the official game card. BEFORE entering McDonalds please black out 6 items on the list to leave you with 10. 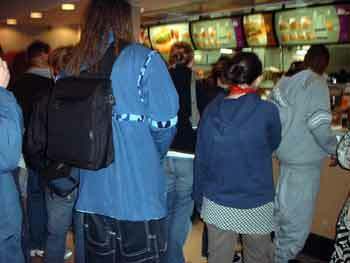 Head into McDonalds and join the queue, as the people in front order their food you mark off the items on your card. The first person to get all the items on their list wins and must shout "McDonalds BINGO!". Everyone has 10 seconds to evacuate the store. McDonalds in Leicester Square was the chosen venue for this round, after building work had redesigned the track in the original stadium we had chosen. 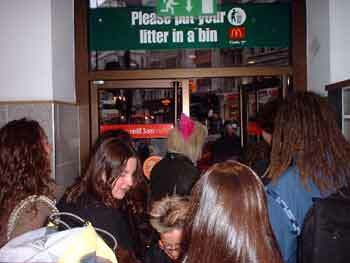 With 8 lanes and a full seating area for supporters and fans the McDonalds in Leicester Square is one of the greatest McBingo venues in London. Our team had grown by this event to nearly 30 athletes and the heat was on to find a champion. Entering our lanes we all listened out as the Cashiers called out the McBingo items. The game took slightly longer than we had anticipated and a few athletes reached the front of their lanes before filling their cards. In order to keep the relay going they quickly announced that "They were not yet sure what to order" and headed to the back of the lane to continue the game. There was a panic amongst the athletes and a visible shock within the crowd when it was announced that the milkshake machine was out of order. As more and more athletes reached the front of their lanes the store manager decided to phone head office to tell them how well it was going. I was "in the zone" as the game went on, with only one item left on my sheet. I was nearly tempted to buy the item in order to win, but swiftly remembered the Corporate Games Rule No.2  "Anyone buying anything at all from any of the stores is instantly disqualified". Not wanting to bring humiliation to the home nation I soldiered on. Suddenly to my right a Girl called out "McDonalds Bingo!" and the game was all over. We turned and sprinted past the security for the white line at the exit door, and suddenly the stadium seemed half empty. Banned in every school the world over, as this company should be. The contestants line up on one side of the store, someone is the Bulldog in the middle. They shout "Bulldog" and the contestants run to the other side trying to avoid the Bulldog who is trying to catch them. Once tagged the contestants join the Bulldog and security guards in trying to catch the others in their next run. The last person caught wins. By the time of the final, the Metropolitan Police, in charge of Games Security, realised that this was going to be a popular event. Luckily for us they had positioned several riot vans and a line of Police across the doors of the Nike Town Stadium. British Bulldog is a dangerous game and they obviously did not want the untrained public to get caught up in the match. One by one the athletes slipped through the Police lines and began to take up position in the stadium. The game had been arranged for 6pm and you could feel the tension rising. Several undercover police were spotted lurking around the store on the lookout for troublemakers and streakers who may have disrupted the games. Due to the size of the match it was decided that Greenman and I were to both start as the bulldogs. Standing in the centre of the store we took our position as other athletes lined up looking at the merchandise on sale one side of the stadium. There was a no start as the Vacuum Cleaner (thevacuumcleaner.co.uk) ran before the whistle, but with a quick cheer of "British Bulldog, 1, 2, 3" from Greenman and I and the game was underway. Like a slickly oiled machine Nike town security and the Metropolitan Police instantly joined Greenman and I in catching the runners. I managed to grab two contestants, when an over eager security guard grabbed me! The speed of the athletes, security and Police was amazing and the entire game was over within a minute or two. The athletes were all escorted out of the stadium and given a standing ovation by the fans outside. The Police, held back the fans from entering the bulldog pitch, whilst the grounds men prepared for the next event. The Vacuum Cleaner was declared the winner, and he then lead us in prayer to the wonders of Nike, The Police, Global Capitalism and the products we all so cherish. If you would like to host a multinational games in your city please contact the Space Hijackers.